If you are looking at ways that will significantly improve overall life quality and satisfaction, it starts with self-reflection. Five tips to improve your quality of life relate to autonomy, social engagement, health, mood, and finding your sense of purpose. If you were to ask any senior what the most important aspect of aging is, they will likely say something that relates to quality of life. Quality of life encompasses everything from financial security to love and intimacy, and the definition will vary depending on who you ask. There are some universal ways that improve life quality for seniors, including issues pertaining to accessibility and mobility aids to social interaction and leisure. Loss of independence and freedom is a very real fear of many older Americans, and some may worry about being forced to leave their homes or autonomous living situations. The key to maintaining independence in the home is accessibility; this may be based on if you are able to get around safely, complete activities of daily living (ADLs), and access the necessary areas of your home, as needed. 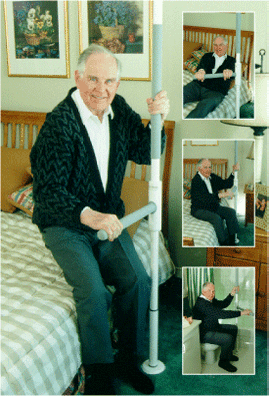 If you struggle with a physical limitation, injury, or disability, you may want to consider mobility aids that facilitate autonomy and that can accommodate levels of independent living. Another element of aging gracefully and maintaining quality of life is social engagement; whether this means getting out and about or having people come by and visit or take you out for leisure activities. Boredom can be debilitating for seniors or those with limited social outlets; battle boredom with plenty of interaction, stimulation, and recreational interests. Life quality is far better when you are healthy and feel good, which brings up fall prevention; over one-third of seniors over the age of 65 fall every year. Curb these incidents with non-slip surfaces, adequate lighting, and simple aids like grab-bars, which can cut-down on falls and prevent serious injuries. See your doctor regularly, get exercise when possible, and stay active and flexible as long as possible for optimal quality and enjoyment later in life. Depression has a way of sneaking up on you, especially if you are older or live alone. Depression is not uncommon among the elderly and lots of things can contribute to depression, like money trouble, health issues, or the death of someone close. Regular, routine appointments with your primary care provider may detect mood problems, but if someone you love is struggling, talk to them about it. A Geriatric Depression Scale screening tool may be used to assess feelings of depression or mood disorder among this population. Don’t let depression negatively impact your quality of life. Finally, the key to overall quality of life is a sense of purpose. Everyone needs a purpose in life and a reason to get out of bed in the morning; this purpose may be derived from rewarding work, a close-knit family, or volunteer endeavors. Many still may not know what their purpose is, but trust that there is one. Figuring out your own purpose may not come easily; it requires contemplation, reflection, meditation, and, for some individuals, prayer. Finding a purpose at any age can greatly improve quality of life but know that you can’t adopt someone else’s purpose, but certainly, you can learn more about your own through others’ experiences so discuss freely with those around you. The simple elements to improving quality of life will vary depending on who you ask, but these five tips are fairly-universal in their application and significance when it comes to overall life quality. Think about the things that are most important to you and how they impact your quality of life each and every day. Commit to making your own life and situation better during Quality of Life Month in January. This period is designated as the perfect time to reflect on your quality of life and overall purpose; are you satisfied with your current situation? Take this time to commit to change the things that you can and that will make a difference in your life quality and satisfaction. Whether it is to visit an eye care provider for new glasses so that you can do more reading to investing in a stair lift so that you can once again sleep in an upstairs bedroom, the changes that you choose to make are as varied and unique as the individual. If improving access is one of the benchmarks of your quality of life, it is time to evaluate and consider mobility aids. Learn more about your options and how your life can dramatically change with accessibility and mobility devices designed to make everyday life easier and more enjoyable. Make today the first day of your new improved life!